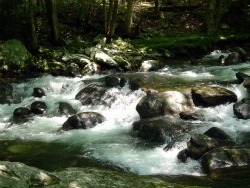 Easy Hikes in the Smokies? 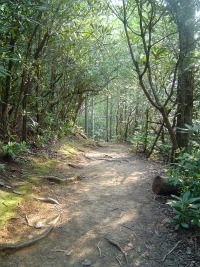 With the height of the Smoky Mountains, you might not think there are any easy hikes. The good news is there are! Keep in mind that this list of hikes is relative and my opinion. I listed these hikes as easy, because they are what I think most people can manage without hurting themselves. However, you know yourself best. So, use your best judgment. Cucumber Gap Loop This is a great hike for those who like variety. You start off seeing some historic buildings on Jakes Creek, on Cucumber Gap you'll enjoy wildflowers and ridge hiking. You'll end with a pleasant stroll down Little River Trail with the soothing sounds of the river to carry you back to your car. This hike is near Elkmont and the total length is 5.5 miles. 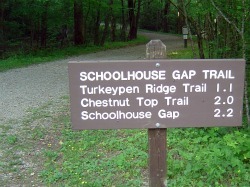 Schoolhouse Gap This trail is actually a wide, gravel road. A stream runs along it and there are lots of wildflowers to see. It's located near the Townsend entrance and is 2.1 miles one-way. Remember you can always stop whenever you want and turn back for a shorter hike.